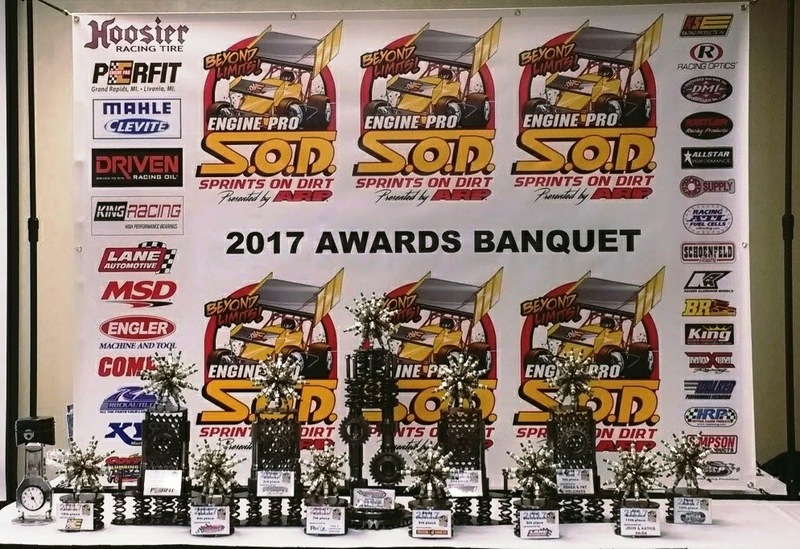 The curtain came down on the Engine Pro Sprints On Dirt presented by ARP 2017 season with the 38th Annual Awards Banquet at the Holiday Inn Battle Creek (MI) Saturday night with the last of the season’s $76,535 points money and awards handed out. The top 12 drivers in season points were led by Steve Irwin, now a two-time SOD champion. 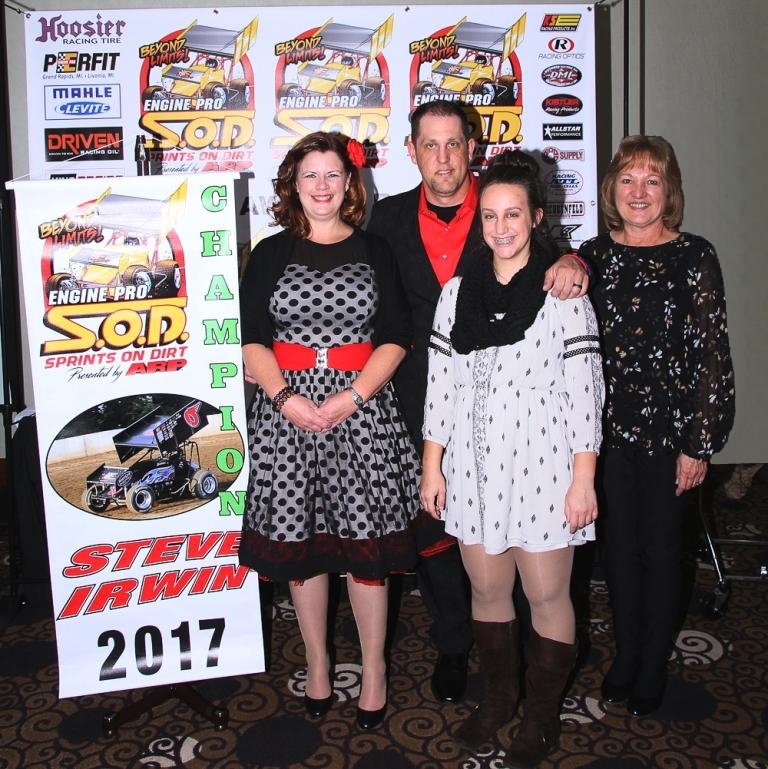 Irwin’s share of 2017 points money and awards was $7,609. Irwin and wife/car owner Adrianna looked ready to appear at a celebrity awards show in their vintage 50s-style attire. Thank you Kathie Naida, Scott Menlen, Julie Beebe, Tim Beebe, Audra Hart, and Pat Holzinger for banquet preparation and services. Thank you to Jim DeHamer, DenHamer Photo, for his photo documentation of the banquet activities. Photos are online at www.denhamerphoto.smugmug.com. 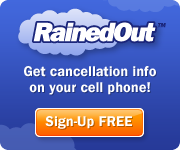 For more information about Engine Pro go to www.enginepro.com. For more information about ARP, go to www.arp-bolts.com. Engine Pro Sprints On Dirt presented by ARP expresses its sincere thank you to our 2017 season sponsor partners including: Engine Pro (Title Sponsor), ARP (Title Sponsor), Hoosier Racing Tire (Official SOD Tire), MAHLE/Clevite (Beyond Limits Challenge Sponsor), Driven Racing Oil (Battlegrounds Bash Sponsor), King Engine Bearings (King of Michigan Sponsor), Lane Automotive/MSD Ignition (Fast Masters Sponsor), Engler Machine & Tool (Heat Race Sponsor), COMP Cams (Heat Race Sponsor), RockAuto.com (Heat Race Sponsor), The Perfit Corporation (Lucky Dog Sponsor), KSE Racing Products (Hard Charger Sponsor), XYZ Machining (Season Sportsman & Crew Chief Sponsor), Jim Coffey & Son Plumbing & Heating. In addition, SOD contingency sponsors include: Allstar Performance, ATL Racing Fuel Cells, BR Motorsports, Diversified Machine Inc. (DMI), K2W Precision/Keizer Aluminum Wheels, King Racing Products, Kistler Racing Products, Maxim Racing, Motor City Racing Promotions, Racing Optics, Rod End Supply, Schoenfeld Headers, Simpson Racing Products, Walker Performance Filtration.